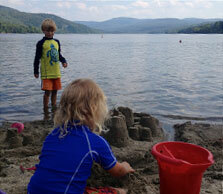 Vermont Parks Forever’s mission and activities align with the long-range priorities of the Vermont State Parks system. To do this, VPF focuses on three priorities (1) inspiring stewardship of natural places, (2) providing innovative educational experiences, and (3) improving access for underserved communities. To meet these goals, we collaborate with Vermont residents, parks visitors, and state government to improve our parks for the benefits of residents and visitors alike by raising funds and investing in innovative projects and partnerships. Business Partnership Program: a partnership enabling local businesses to help protect and enhance our parks, while enjoying free park passes and other business benefits. Natural Connections: an innovative public/private partnership to redesign and restore nature centers to enhance educational opportunities in six state parks. Foster Family Park Passes Program: a program supplementing park passes available to Vermont foster families. Mount Philo Forever Summer Internship: a memorial program that offers an opportunity every year for a young person to connect with nature and develop professional skills in a state park setting. Stone Hut Project: a fundraising effort to rebuild the beloved Stone Hut atop Mount Mansfield. Park Stories: capturing and sharing the amazing stories of visitors enjoying Vermont’s beautiful state parks. Contributions in any amount are always welcome and can be made online using the button below or mail your check made out to Vermont Parks Forever to PO Box 815, Montpelier, VT 05601.